The KSG is Kel-Tec®'s first entry into the shotgun market. Its compact, bullpup design measures 26.1" overall and is perfect for hunting in thick underbrush or home-defense situations. Even with its compact size, the internal dual tube magazine holds up to 12 rounds of 3” shells and reliably cycles shells as short as 1 3/4" and as large as 3" with no hiccups. It also comes equipped with two Picatinny rails... one for mounting a forward grip, light or laser, the other for mounting optics or iron sights. Note: Shotgun does not include the following accessories shown in the image. Muzzle break, flip up front/rear sights, vertical foregrip and elevated cheek rest. 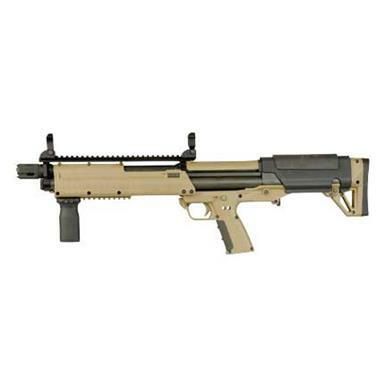 Kel-Tec KSG, Pump Action, 12 Gauge, 18.5 Barrel, 12+1 Rounds is rated 5.0 out of 5 by 1.